Adolfo P. Carranza en el Museo Histórico Nacional; Carranza, Adolfo P.
Why is it that a national institution, rather than dramatizing through monumental displays the grandiloquent and archaizing kind of national history acted out by armies and crowds, should have taken to a museum aesthetics which underscored the private, sentimental attachment to past objects so common in homes which have been for generations in one and the same family? Or, to put it more boldly, why is it that memory rather than history seems to address us from this photograph of the National History Museum? Constructing a material 'heritage', an historical patrimony of objects and places, as opposed to the narrative of progress and evolution which unfolded at the same time at Francisco P. Moreno's Museo de La Plata, had a rather defensive purpose, namely, to create, in the face of new urban populations and of the masses arriving from overseas, a deeper layer of identity, a mnemonic nationality which aprioristically excluded them altogether from a space of 'true' citizenry no longer defined -as in Sarmiento's Facundo (1845)- in in terms of civilization but of culture. After 1880 private collectors and family historians were appointed to numerous committees, to advise on the correct classification and placement of objects, dividing epochs and periods from one another and pointing out the exceptional events that separated them. Selecting and classifying those family memorabilia was the prime operation of this new kind of national historiography, an operation which, while conceived as the final closure of the epic history it displayed, was sometimes explicitly compared to this history as a new, though civic and bookish, moment of heroic foundation: one not of nationality, but of the State as its logical, organic consequence. It is precisely the first of these intents to put national history on display, which highlights the ways in which "historiographical" time and exhibition space now overwrite those of "history". History, the time of the nation-as-narrative, comes to triumphantly conclude in historiography, the time of the State-as-narrator. 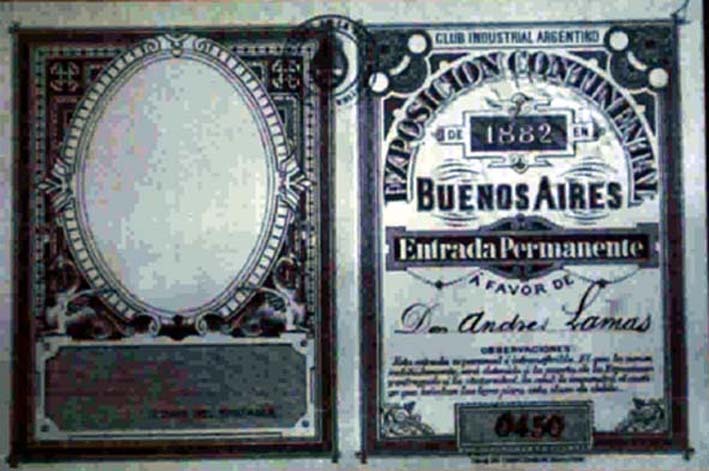 On wednesday, march 15th, 1882, La Libertad of Buenos Aires, under the headline "Exposición histórica: Acuerdo extraordinario de la Comisión" (Historical Exhibition: Extraordinary Agreement of the Commission), reports on the plan of an historical show, to be installed on the premises of the Continental Exhibition inaugurated the night before. The exhibition, the paper informs, which would "represent by way of authentic objects the different epochs of the history of the River Plate, its progress, its glories, significant events, and the memories associated to its illustrious men", was to consist of twelve sections stretching from archaeological objects of the "Argentinian prehistorical" and "Columbian era" to numismatics. Other sections were to include a collection of charts, books and portraits from the "era of discovery, [...] as well as other objects awakening memories of this great era"; one of paintings and prints (emphasizing portraits and historical subjects); furniture; manuscripts from the conquest to Independence; two sections of typographical exhibits, one of which depicting the history of the printing press; and, finally, maps, from the first documents of discovery to battle and nautical charts. 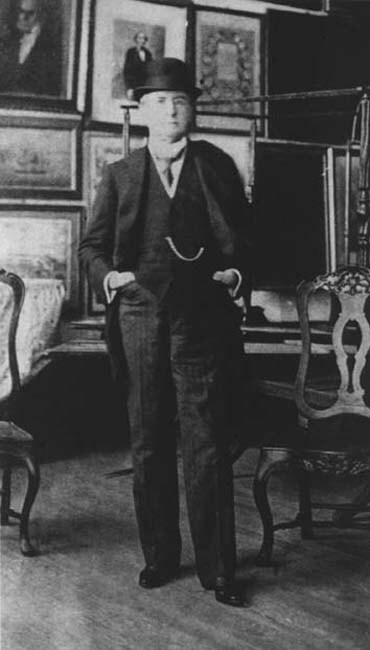 The exhibition committee had been chaired by Andrés Lamas, veteran liberal agitator and author of an historico-geographical dictionnary of the River Plate, with Angel Justiniano Carranza -"el Casaubon criollo" (Quesada 1897: 13)-, probably the most important private collector of national memorabilia at the time, acting as secretary, and Estanislao Zeballos, the young director of the National Geographical Institute and "owner" of an enormous collection of indigenous remains raided from funeral sites in the South, among its most prominent members. It was this imaginary link between an heroic foundation and the industrial epic on display at the Continental Exhibition which Lamas, in his initial drafts for the history show, had sought to stress much more than the final version eventually would. Lamas seems to have pursued this idea until shortly before the opening of the Continental Exhibition. 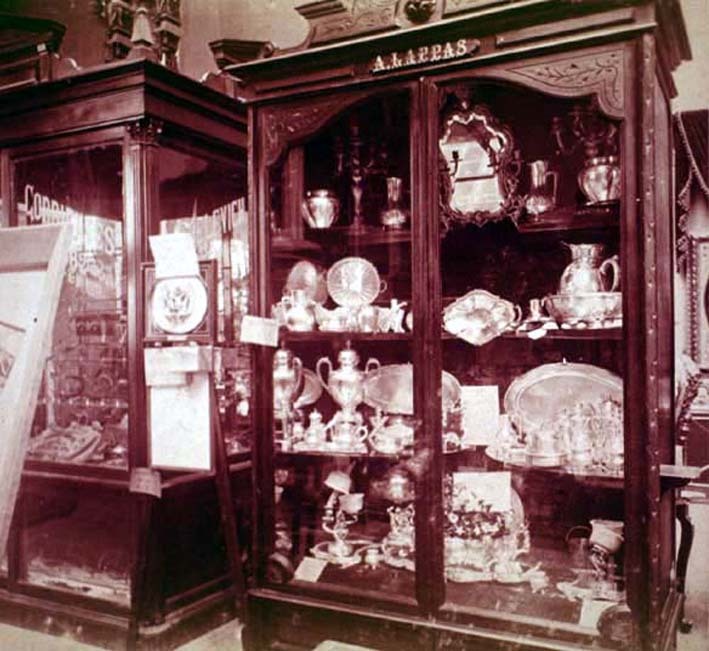 In a letter to the government secretary of the province of Buenos Aires, dating from February 22nd, 1882, Lamas asks for the loan of objects from government agencies and from the province´s own museum, which by then had not yet moved to the (still inexistent) city of La Plata. 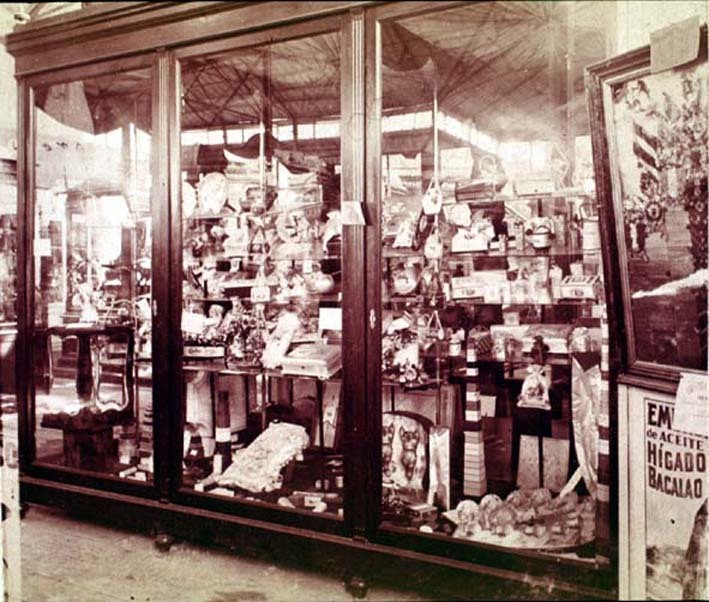 The objects now requested would have considerably broadened the original scope of the show, extending national historical time both towards the past -with documents recalling the second foundation of Buenos Aires by Juan de Garay in 1580-, and towards the present -with trophies brought back by the province´s bataillons from the Paraguayan War (1865-1870). In three years of planning, it seems, the initial sketch of a one-act play on nation foundation spanning across the first two decades of the nineteenth century, had become an epic history and an embryonic museum narrative, stretching over four centuries. Lamas´s ambitious project, however, was not met by unanimous support from the historical commission. Zeballos in particular, apparently echoing complaints received from the Comisión Nacional Inspectora, the central committe of the Continental Exhibition, disapproved of the inclusion of objects still capable of embarrassing neighbouring countries which were to participate in the show -such as, he feared, would the trophies from the wars with Brazil and Paraguay-, or those recalling the all too recent clashes between federals and unitarians, or between porteños (literally, port dwellers, a term used in Argentina to refer to the inhabitants of the city of Buenos Aires) and provincials. (Dosio 1998: 13-18) It was Zeballos´s rather than Lamas´s version of history, then, which was finally put on display at the Continental Exhibition. Not only did this narrative on the evolution of skills, science and craftsmanship seem more at ease with the general scope of the event and with a focused temporary display of objects than Lamas´s draft for a national history museum; it also met the needs of a moment more concerned with reconciliation than remembrance. The Continental Exhibition had itself, in fact, almost fallen prey to the "archaic forces" of a history whose very disappearance it was to celebrate. Conceived in the context of an Industry Exhibition held in 1877 on the premises of the prestigious Colegio Nacional, the event was originally supposed to take place in 1880. Apart from a poor response from potential exhibitors of neighbouring countries (some of them deeply involved, by then, in the War of the Pacific), the Exhibition´s fate was sealed by the turbulences surrounding the presidential election that same year. As it became clear that Roca, the candidate of an inter-provincial alliance later to become the Partido Autonomista Nacional, would impose his candidacy, the rival aspirant and governor of Buenos Aires, Carlos Tejedor, declared a state of siege that forced the national government to seek refuge at Belgrano, then on the far outskirts of the capital. 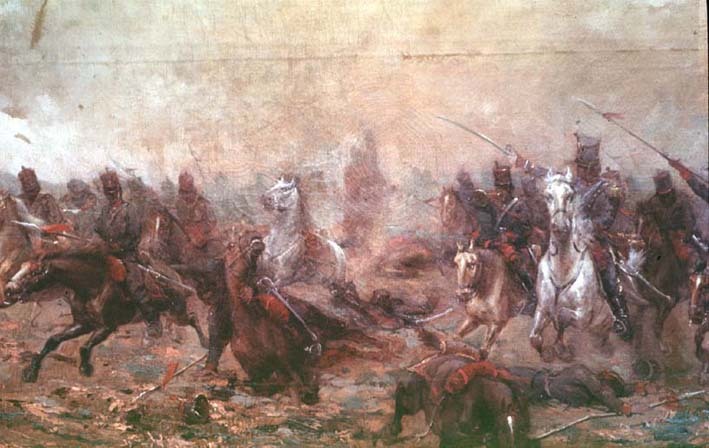 Three thousand died in this -until then- bloodiest of Argentinian insurrections, in which a total of 20,000 soldiers, and eighty pieces of heavy artillery, took part. In a somewhat farcical manner, the original turmoil of heroic foundation makes its return, as rebellion and political passions obscure the city of commerce and industry. And, moreover, in the light of this atavistic, uncanny return it appears as no minor detail that the would-be theatre of this foundational epic, Lamas´s historical exhibition of military glories, should be evacuated from the Palace that would eventually arise from the ruins of the 1880 uprising. In this critical moment of consolidation of a centralized State authority the mission of historiography was to confirm the end of history and the country´s entry into the age of politics. The epic and military narrative championed by Lamas, however, would re-emerge less than ten years later, in the face of a different kind of crisis. However, as if the ill-fated trajectory of the history show at the Continental Exhibition was to repeat itself, once again the decision to museumize national history ocurred in the wake of a major crisis which threatened not only to consume the financial base of the institution, but to destroy the safe haven of a present from which to judge and exhibit the past. 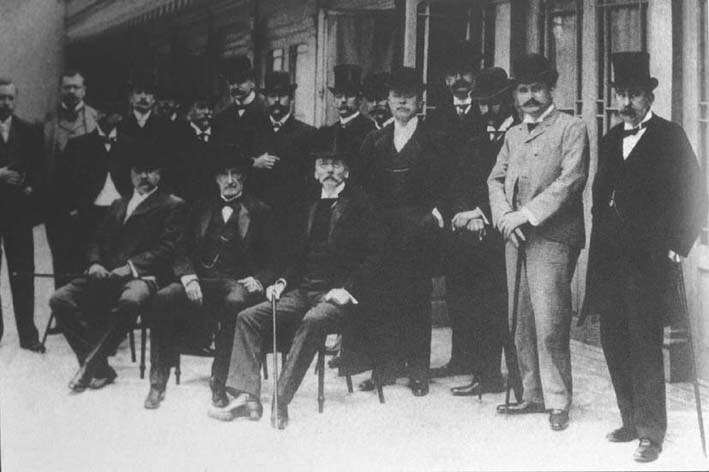 Financial instability and political crisis had overshadowed the presidency of Roca´s sucessor Miguel Juárez Celman from its very beginning. Only a few days before Seeber decreed the Museum´s foundation, national government had closed the Buenos Aires stock exchange by force, and discontent among dissident factions of the governing PAN, Mitre´s oppositional Liberal Party, and some old-time porteño populists such as Leandro Alem and Hipólito Yrigoyen, was growing into an explosive constellation. On July 26th of the following year, a month before the Museum was to be inaugurated, street fighting started in the capital, this time leaving over 250 dead and 1000 wounded. Juárez Celman resigned to make way for Carlos Pellegrini, the "reformist" vice-president, following a truce with the autonomist and liberal dissidents which for the remaining 'Radicals' left only the option of unconditional dissent with the existing power structure. (Halperín Donghi 1969: 329) In the following years, occasional electoral triumphs of the Civic Radical Union, wherever free voting was possible, alternated with rebellions that broke out at Córdoba, San Luis, Santa Fe and Tucumán, and even in the province of Buenos Aires itself where insurgent radicals set up a provisional government at La Plata. Thanks to the modernization of transports and infrastructure which allowed the federal army to move quickly from capital to province, all these insurrections were rapidly crushed, again with hundreds of victims. However, if 1880 had seen the last battle in a long struggle between national and provincial interests, the challenge in 1890 was of a quite different kind. On introducing a new, modern type of party organization independent from the political machinery of the State, and representative of a public sphere where urban, liberal professionals had begun to dominate, the radicals did not question the nation-state as such but the legitimacy of the oligarchic regime. The process of the Museum´s foundation directly reflects this agitated political context. Seeber seems to have foreseen some of the trouble ahead when he named as members of the institution´s organizing commission, in addition to the almost inevitable 'experts' (Andrés Lamas, Estanislao Zeballos, Manuel Mantilla and José I. Garmendia), the three potential rivals for presidential succession: young Ramón Cárcano -Juárez Celman´s favourite-, Bartolomé Mitre -patriarch of the liberal opposition-, and, finally, Julio Argentino Roca himself, who was beginning to push for a second term. In spite of the increasingly tense political climate, the commission held regular sessions until, on June 1st, 1890, Mitre chose to leave the country for an undetermined period, not before having made a large donation to the museum. In some ways, then, this tacit agreement between rival factions on matters of national history foreshadowed the one that was to be sealed in national politics only a few months later, and which consisted, principally, in a re-alignment of forces which had identified a common ground in the face of a new oppositional Other. History, by emphasizing the origins of nationality, provided the narrative of this insistent claim to power, in the face of contenders who had nothing but their self-acquired skills to boast. Here, then, the evolution of craftsmanship clearly was not a suitable paradigm for historical display, but rather the epics of heroic foundation which Lamas had drafted a decade ago. 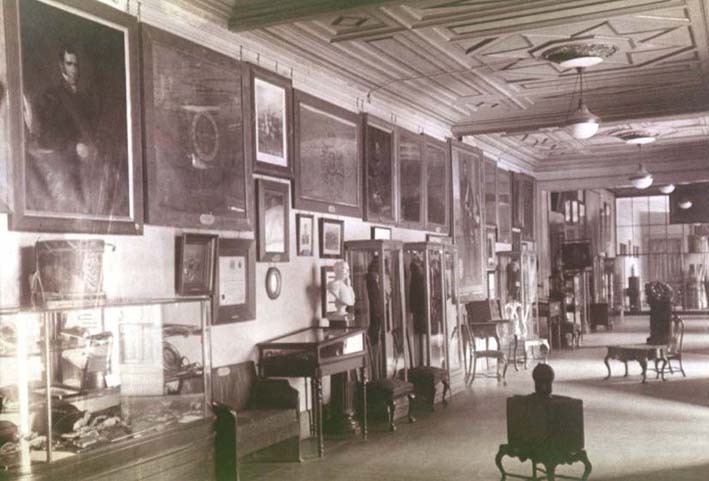 El Museo Histórico Nacional en 1891; Carranza, Adolfo P.
Although only precariously housed in downtown Esmeralda Street and with just 191 objects on display (ranging, according to the first catalogue, from a "gold and silver garland given to general Belgrano by the ladies of Potosí in commemoration of the battles of Tucumán and Salta" to "bells from the Correntine missions"), the museum managed to open on August 30th, 1890. 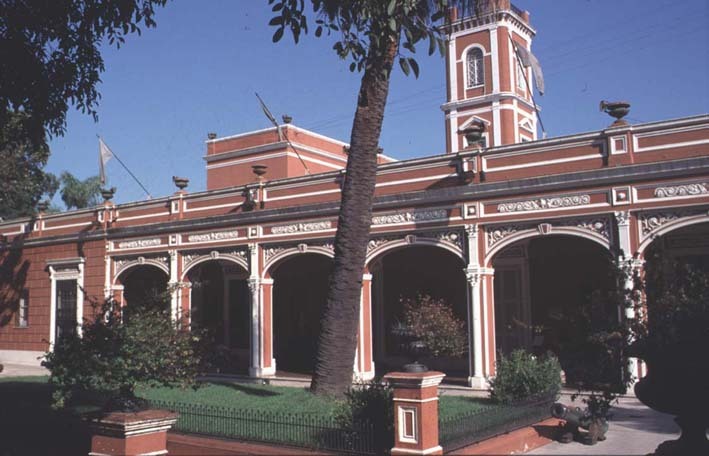 Carranza, who had been appointed director of the institution, in his correspondence with the City Council complained that the lack of space and high rent consumed half his budget, and tried to secure a purpose-built exhibition site on the grounds of the old Retiro barracks. 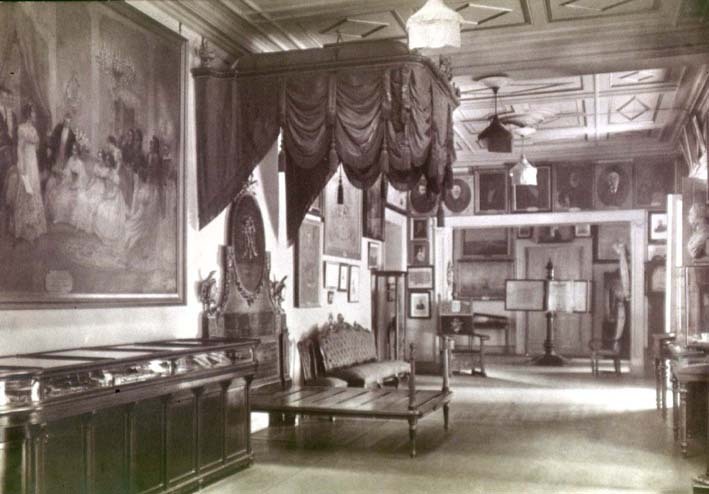 All he was able to get, however, were six rooms on the ground floor of the City´s Chemical Office at Moreno 330, where the exhibition moved on February 15th, 1891, with its already 284 pieces. In September of the same year, the museum was nationalized, and in January 1894, now counting some 886 pieces, the establishment moved to the Botanical Garden at Avenida Santa Fe 3951, finally occupying its own building with fourteen rooms. 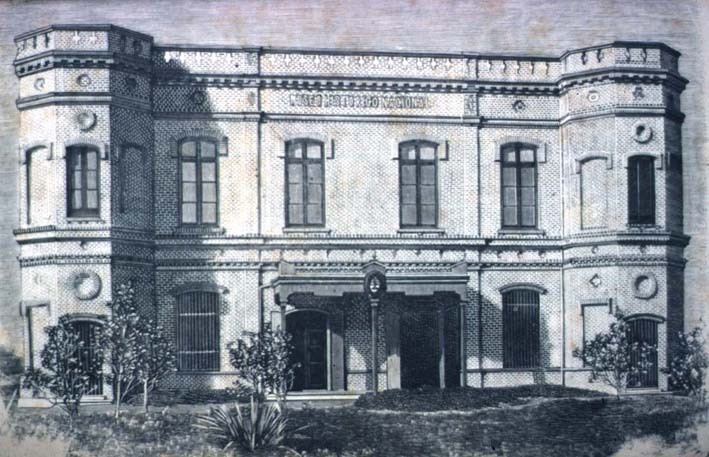 Museo Histórico Nacional, Buenos Aires; Carranza, Adolfo P.
Nevertheless Carranza, in a letter to the Home Secretary from February 2nd, 1897, continued to complain about "the reduced size of the building it occupies today, and the humidity which destroys the objects there"; but instead of the Retiro site he was only granted, in exchange with the Department of Parks and Gardens, the old mansion of José Gregorio de Lezama at San Telmo, near the (hypothetical) spot where the city had been founded by Pedro de Mendoza in 1536. Certificado de donación; Carranza, Adolfo P.
Such an immediate political intention in donating exhibits, however, seems to have been the exception. Carranza personally undertook to write not only to renowned collectors such as Mitre and Lamas, but in the first place to relatives of the military officers who had participated in the independence struggles and the wars with Brazil and Paraguay, asking them for portraits and personal belongings of their "family notables", preferably to be accompanied by a short biographical essay, so as to display them "in the establishment´s salons, side by side with those of their companions in glory and in sacrifice" (Carranza to Agustín Muñoz Salvigny, undated). The museum´s policy regarding collecting was clearly dominated by military history -or an epic, chivalric version of military history- and focused, moreover, on the external wars fought by the country since independence, downplaying the (much more profound and enduring) struggles within Argentina itself. Objects of military use (firearms or fieldbeds), belonging to officers rather than common soldiers, together with those of an already allegorical nature (such as flags or military decorations) and, finally, battle paintings made after the events themselves (some of them commissioned by the museum), composed by way of images and material objects, a dematerialized, heroic narrative stripped of dirt, blood and agony, and instead emphasizing spiritual values such as virtue, honour and bravery. Inspired by the historical writings of Bartolomé Mitre, himself a lifelong friend of Carranza and patronizer of the institution, this iconography of a belligerant yet virtuous Argentina was centred around the characters of Belgrano and San Martín, emblematic figures of nationality precisely because of their rather low political profile. 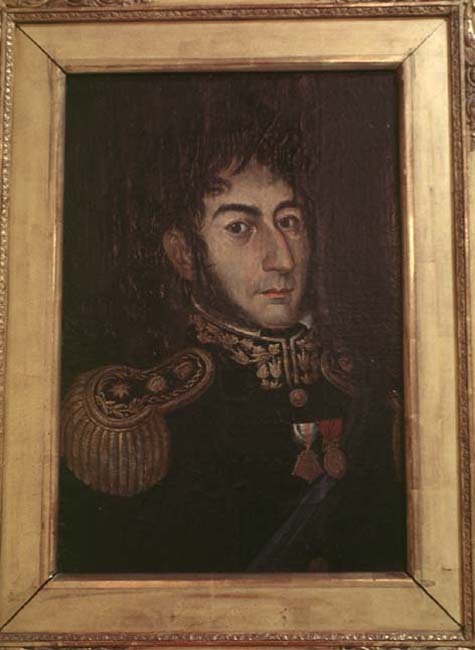 Retrato del General José de San Martín; de Castro, José V,. In 1899, Carranza managed to convince San Martín´s granddaughter, then residing in France, to ship to Buenos Aires not only another series of paintings but the very bedroom the exiled general had occupied at the time of his death in Boulogne-sur-mer, to be reconstructed within the museum. That same year, the mise-en-scène was concluded thanks to the donation, by another famous exile, Manuela Rosas de Terrero, of the final piece: the sable which San Martín had sent her father, the 'federalist' dictator Don Juan Manuel de Rosas, as a sign of appreciation in the times of the Anglo-French siege. As the remains and the worldly possessions of the founders returned to the country, the old, creole Argentina came to be reconciled, it seemed, as finally sharing an -however troubled- family memory common to all. However, objects representing the period of Rosas and the action of the popular, antiliberal montoneras remained sparse: among others, a letter by Facundo Quiroga and an autograph by Vicente "El Chacho" Peñaloza, the federal caudillo killed on Sarmiento´s orders, both donated by Carranza, and several flags taken from the forces of Ricardo López Jordán (the last insurgent federalist) between 1870 and 1873, donated by the Presidency. These pieces, then, were hardly ever donated by relatives of the actors involved but rather by political opponents who had guarded them as trophies, indicating the inscription of the museum´s aquisition and exhibition policy within the dominant strain of liberal historiography. From its very foundation, too, the museum under Carranza´s direction took part actively in a larger project of cultural diffusion, for instance, by promoting the repatriation of the remains of famous Argentines who had died abroad, and organising the celebrations surrounding their eventual arrival. 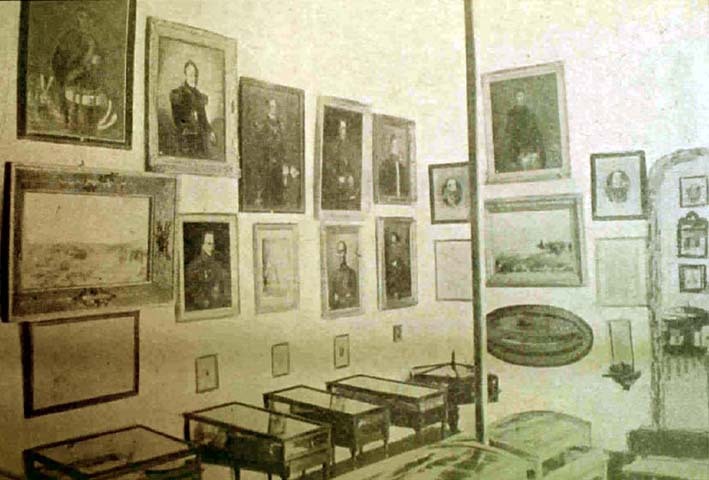 Schools and the military -the positivist State´s complementary institutions of instruction and drill- were encouraged to send their recruits on organized tours through the museum; national holidays were celebrated by distributing reproductions of portraits or distinguished objects from the collection. Another of Carranza´s ideas to distribute and multiply historical imagery consisted in sending copies of portraits from the museum´s collection to schools, or to town halls and councils of municipalities, named after the personality in question. 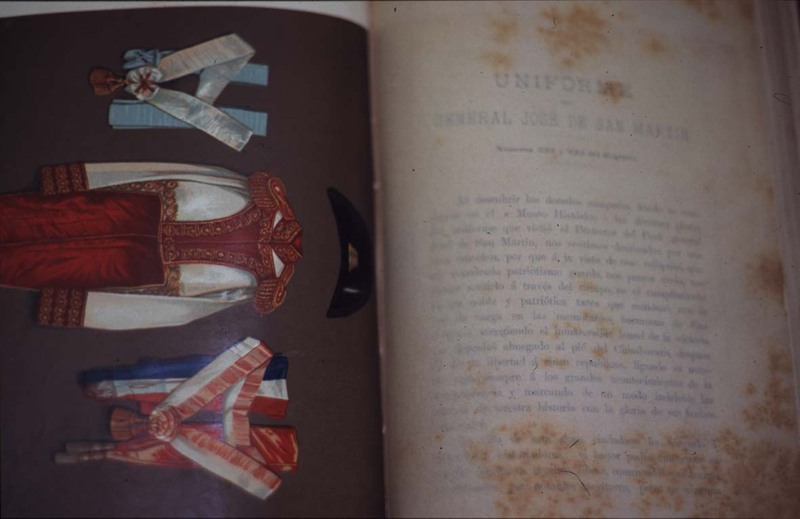 Between 1891 and 1898, four profusely illustrated volumes of El Museo Histórico were published, containing, apart from institutional proceedings, enyclopaedic notes on a number of collection pieces. El Museo Histórico. 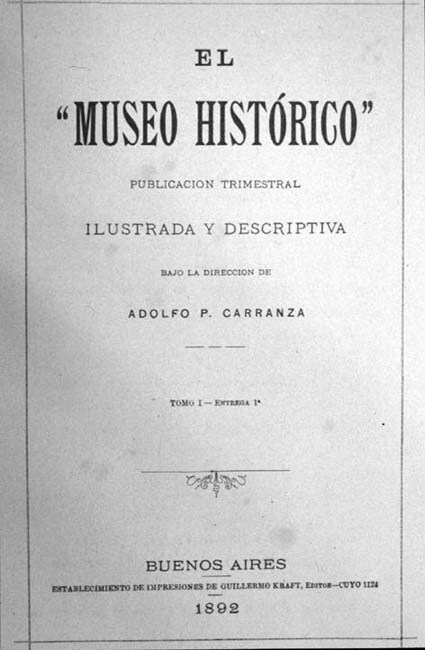 Publicación trimestral ilustrada y descriptiva bajo la dirección de Adolfo P. Carranza; Carranza, Adolfo P.
Following 1908 the museum started issuing La Ilustración Histórica, an illustrated journal especially produced for school use. From 1903 Carranza supervised the distribution of commemorative plates in the capital and took part in the preparations for the centennary of 1910, advising artists on historical subject matter. The museum, then, tried to not restrict itself merely to the storage, preservation and display of historical relics, but instead engaged actively in the production and distribution of "historical" exhibits. Despite its limited resources, the museum was conceived by Carranza and his collaborators as a centre of patriotic radiation, a home of history from which to (re-) conquer streets and places, schools, army barracks and town halls, all marked by the magic names from the past. 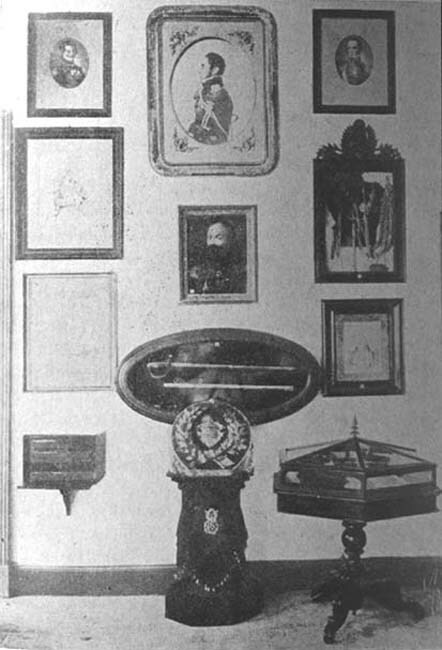 One of the earliest photographs of the exhibition at Parque Lezama, dating from the turn of the century, illustrates the use made of the additional space now available: the objects -once again, mainly portraits, period furniture and smaller exhibits (presumably medals, coins and the like), displayed in glass boxes- are now commanded into line, with the visitor parading, as in a military inspection, along the large middle corridor. 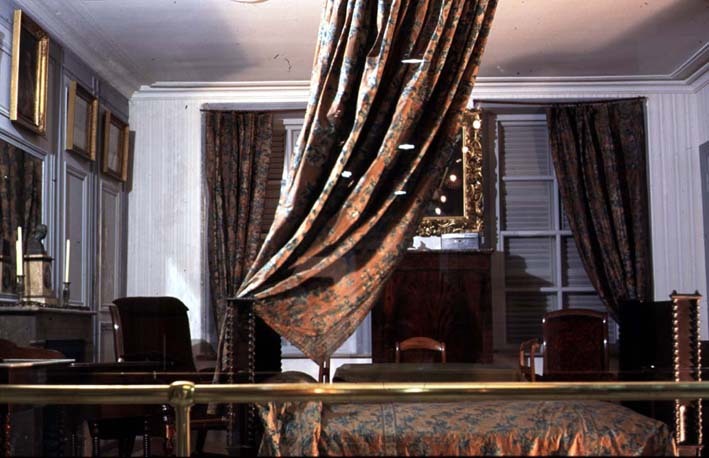 In the old building, due in part to the lack of space to create distance and detach viewers from objects, an all too explicit private intimacy with the past had ruled; in the splendid new mansion´s long and linear galleries, the distance is almost as great as to give the impression of memories of another country parading along the walls. The result looks preliminary, and it is only in the space of a text, that a discursive dimension is imposed onto the strangely vague order of display. Following the removal of the collections to Parque Lezama, Ernesto Quesada -author of some pioneering essays on historical and philological subjects- made a number of visits to the institution, the written accounts of which were then distributed as guides by the museum itself. Not surprisingly, this written narrative stressed the noble and understated character of the nation´s founders, particularly San Martín, as opposed to the unhealthy and impostorous ambition of Bolívar (embodying the foreigner, the outsider to nation and class): the argument here is not only a nationalist one, which tries to reclaim as Argentine the laurels of South American independence, but, more importantly, it rereads creole history in the light of the challenge the regime faced from the margins of political space. Quesada´s blow against the charismatic revolutionary Bolívar, and in favour of a conservative, aristocratic San Martín, is also aimed -not too implicitly- at the radical caudillos then involved in constructing a base of power beyond the limits of creole aristocracy, and drawing heavily on the mythology of national popular tradition. (Rock 1975) As if to drive the point home, in a very literal sense, the museum, following the acquisition of San Martín´s "relics" in 1899, now returns (albeit in a monumental way) to the domestic aesthetics it had intended to leave behind on moving into more spacious accomodation. The faithful reconstruction of the French death-chamber where the general had expired, as the inner sanctum of the museum, celebrates a homecoming of history and into history, a sense of dwelling in the past. As it finally returns, now conscious and deliberately, to its more intimate model, the bourgeois interior, the museum -now transformed into a monumental death-chamber of absent founding fathers- captures a vanishing history by eternalizing this very moment of vanishing and thus prolonging it into eternity. It is, we might conclude, not in the first place the objects which are being fetishized here by the museum form, but the museum form that is objectified, through the use of objects which are in themselves ephemeral, as an icon of the State. or in the central gallery which displays, surrounded by period portraits of the notables of Independence and impressively arranged furniture from the late colonial era, a large painting by the Chilean Pedro Subercaseaux, especially commissioned by the museum for the centennary of 1910, depicting the first performance of the national anthem. In a moment of professionalization of national history as a discipline following the foundation of a specialized department at the Faculty of Philosophy and Letters in 1912, and in a context of political democratization, it seems, museum history has at last discovered its potentials as an instrument of forging a national consciousness. But even if the museum, apparently, has finally identified "the people" as its addressee, the narrative it now tries to develop by more suggestive means of display, certainly remains the one of liberal orthodoxy. 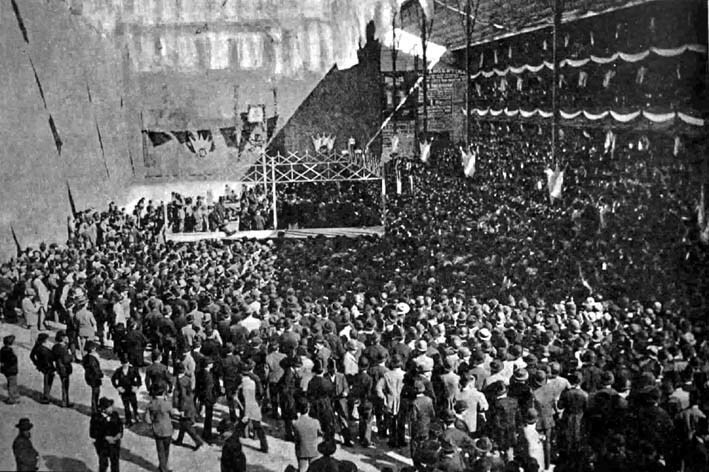 It is little surprising, then, that the new, militant and reactionary, brand of authoritarianism which would seize power in 1930, was to draw heavily on these new technologies of performatizing history: in september 1931 the museum was chosen to host the festivities celebrating the first anniversary of general Uriburu´s military coup which had overthrown Yrigoyen´s second government. Following a parade with historical flags, a banquet at the museum celebrated the return to the values of the past. Andermann, Jens. 1997. "Total Recall. Texts and Corpses: the museums of Argentinian Narrative", in: Journal of Latin American Cultural Studies 6, 1: 21-32. Andermann, Jens. 2000a. "Entre la topografía y la iconografía: mapas y nación 1880", in: Marcelo Montserrat (ed. ), La ciencia en la Argentina entre siglos, Textos, contextos e instituciones, Buenos Aires, Manantial: 101-125. Andermann, Jens. 2000b. "Mármol: políticas del intérieur", in: id., Mapas de poder, Una arqueología literaria del espacio argentino, Rosario, Beatriz Viterbo Editora: 56-67. Andermann, Jens. 2001. "Reshaping the Creole past: History exhibitions in late nineteenth-century Argentina", Journal of the History of Collections 13, 2: 145-162. Anonymous. 1882. 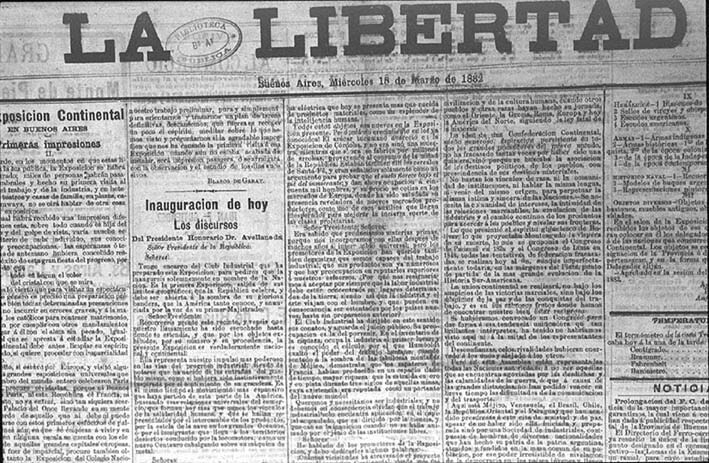 "Exposición Histórica - Acuerdo extraordinario de la Comisión", La Libertad miercoles 15 de marzo de 1882: 1. Anonymous. 1888. "Museo Nacional de Armas", La Prensa, 20 de noviembre de 1888: 1. Anonymous. 1890. "El Museo Histórico Nacional", La Prensa, domingo 31 de agosto de 1890: 1. Benjamin, Walter. 1997. "Über den Begriff der Geschichte", in: id., Gesammelte Schriften, Band I, 2 (Abhandlungen), Frankfurt/Main, Suhrkamp: 691-704. Bennett, Tony. 1995. The Birth of the museum. History, Theory, Politics. London: Routledge. Botana, Natalio. 1977. El orden conservador. La política argentina entre 1880 y 1916. Buenos Aires: Hyspamérica. Cambaceres, Eugenio. 1885. Sin rumbo. Buenos Aires: Centro Editor de América Latina, 1968. Carranza, Adolfo P. Correspondance and notes from personal archive, Museo Histórico Nacional, Buenos Aires. Carranza, Adolfo P. 1891. "Prospecto", in: El Museo Histórico I, 1: i.
Carranza, Adolfo P. 1905a. Los grandes ciudadanos. Buenos Aires : Editorial Rosas. Carranza, Adolfo P. 1905b. San Martín. Buenos Aires : Museo Histórico Nacional. Carranza, Adolfo P. 1910. Patricias argentinas. Buenos Aires : Sociedad Patricias Argentinas " Dios y Patria "
De Garay, Blasco. 1882. "La Exposición Continental en Buenos Aires - ayer, hoy y mañana", in : La Libertad, miércoles 15 de marzo : 1. Dellepiane, Antonio. 1921. "Una visita al Museo Histórico Nacional", Tribuna Libre 4, 98 (Buenos Aires, 13 de julio de 1921): 20. Dosio, Patricia Andrea. 1998. "Una estrategia del Poder: la Exposición Continental de 1882", Hipótesis y Discusiones 15, Buenos Aires: Facultad de Filosofía y Letras, Instituto de Literatura Argentina "Ricardo Rojas". Eiras, Carmen Teresa. 1986. "La Exposición Continental de 1882", Separata del IV Congreso Nacional y Regional de Historia Argentina, Buenos Aires, Academia Nacional de la Historia: 217-231. El Museo Histórico . 1892-1897. Tomos I-IV. Buenos Aires: G. Kraft / Museo Histórico Nacional. García, Stella Maris et. al. 1992. Nuestros Museos: 500 años de historia a través de su patrimonio, Buenos Aires: Ministerio de Cultura y Educación. González, Joaquín V. 1888. La tradición nacional. Buenos Aires: Hachette, 1957. Gutman, Margarita & Hardoy, Jorge Enrique. 1992. Buenos Aires - historia urbana del area metropolitana. Madrid: Mapfre. Koselleck, Reinhart. 1995. Vergangene Zukunft. Zur Semantik geschichtlicher Zeiten. Frankfurt a.M.: Suhrkamp. Lamas, Andrés. 1879. Draft on a historical exhibition. Manuscript. Archivo General de la Nación, Archivo Andrés Lamas, legajo 61. Maleuvre, Didier. 1999. Museum Memories. History, Technology, Art. Stanford: Stanford UP. "Museo Histórico de la Capital". 1890. Decretos publicados en la Revista Nacional. Museo Histórico Nacional. 1892. Catálogo. Buenos Aires: Museo Histórico Nacional. Museo Histórico Nacional. 1891. Catálogo. Buenos Aires: Imprenta Europea. Pearce, Susan. 1994. "Objects as Meaning; or Narrating the Past", in : id. (ed. ), Interpreting Objects and Collections, London, Routledge: 19-29. Pomer, León. 1998. La construcción del imaginario histórico argentino. Buenos Aires: Eds. de América Latina. Pomian, Krysztof. 1990. Collectors and Curiosities. Oxford : Polity Press. Poulot, Dominique. 1997. "Alexandre Leloir et les musées des monuments français", in: Pierre Nora (ed. ), Les lieux de mémoire, Paris, Gallimard, 1997: I, 1515-1543. Rock, David. 1975. Politics in Argentina 1890-1930. The Rise and Fall of Radicalism. Cambridge: Cambridge UP. Taussig, Michael. 1993. "Maleficium: State Fetishism", in: Emily Apter & William Pietz (eds. ), Fetishism as Cultural Discourse, Ithaca, London, Cornell UP: 217-247.